Glucosamine and Chondroitin products are one of the safest and best treatments for the crippling effects of osteoarthritis that affects millions of aging pets throughout the United States. With the growing popularity and with so many choices on the market, it is hard to determine what products are best. That is why Wind River Veterinary Service recommends and sells Liquid Health Pets Joint Supplements both for dogs and cats. Liquid Health is one of the leading pet supplement and vitamin manufacturers in the USA that operates under strict state and federal safety guidelines. Only the highest quality ingredients available are used to ensure that your pet gets the best supplements. 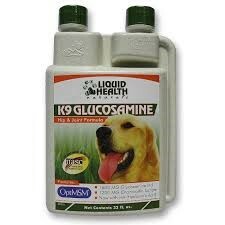 Liquid K9 Glucosamine chondroitin for dogs is a liquid joint supplement for dogs. Nearly 25% of all dogs will develop joint mobility issues of some kind. For younger dogs, glucosamine and chondroitin are an easily absorbed and may stimulate the production of proteoglycans, which help maintain the health and resiliency of joints and connective tissues. MSM promotes general good health. Supplements in a liquid form are shown to absorb more quickly & efficiently than tablets, offering faster results. 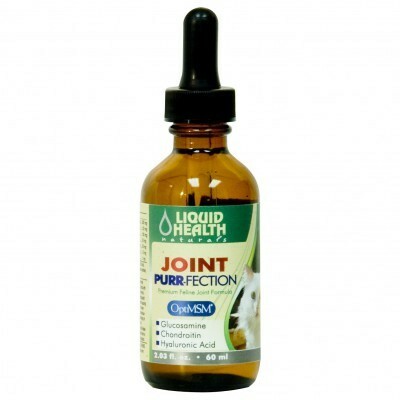 Joint Purr-Fection is one of the leading liquid cat joint supplements manufactured in the USA. It includes glucosamine and vitamin C for better overall cat health. We all want our kittens to grow up into active, healthy cats. In addition to a healthy diet and active lifestyle, an important part of a cat’s health is getting the proper cat joint supplements that they need. This is especially true for older cats that may have joint problems or restricted mobility.